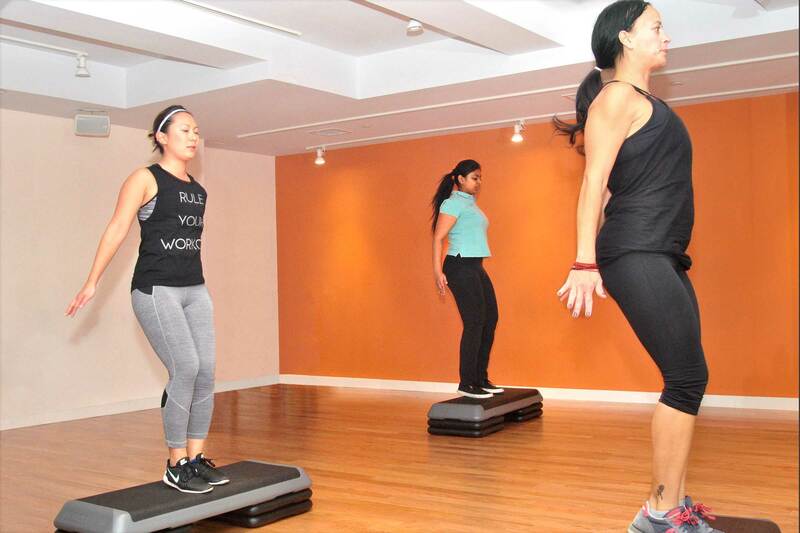 We have a wide variety of classes to match your schedule and fitness goals. No matter which class you choose you will get a great workout. Our 30, 45, 60 and 75 minute long classes will help you stick to your exercise program whether you have a busy schedule or more time to dedicate to your workout. The schedule is designed for you to be able to take multiple classes back to back for a complete program of cardio, strength and flexibility. What can I expect when I arrive for class? Our friendly desk staff will greet you and ask you to sign in. You can let them know whether or not you have filled out your profile information and waiver form online in advance, if not they will ask you to fill out a short form so that we can create your profile, purchase a class and sign you in. If you have not been here previously they will give you a short tour. We have two rooms for classes. One on the ground level with a sprung floor for the more active fitness classes and the other on the Mezzanine Level for Yoga and Pilates. The room will be noted on our online schedule and you can always ask at the desk if you are not sure. It’s best to bring a water bottle and for active classes you will need sneakers. In order to keep our studios clean we request that you save a pair of sneakers that you only use indoors. We have mats and towels available for your convenience. Enrolling ahead of time reserves your place in class. It also helps us to know how many people will be attending, especially for equipment based classes like Body sculpting, Step and Dharma Wheel. What if I have a health issue that may effect my participation? If you have a health condition, please let the instructor know prior to the start of the class. After a long time of sedentary living/work and upon returning from surgery or injury; you should always get a checkup and clearance from your doctor before starting an exercise program. You should have also completed all of your physical therapy prior to joining a group class. A few sessions with a personal trainer can help you ease back into exercise, and your trainer can help you decide which classes may be best for you. This is part of the reason why we offer a free session with our unlimited memberships. Our instructors are friendly and knowledgeable. They understand what it takes to get fit and healthy and are passionate about sharing this knowledge with you. Each instructor has their unique personality and field of expertise. We suggest you try a wide variety of classes and instructors to find out which ones suit you the best. You will get results if you start and stick with the program and a motivational instructor will help you do just that.